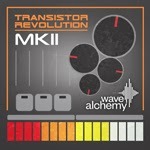 Our brand new Transistor Revolution MKII update is nearly here! We have given Transistor Revolution a complete overhaul resulting in a brand new user interface, intuitive step-sequencer, and a wealth of new features, many of which born from the feedback we have received from TRMKI users. So as Ed mentioned in his last post our recording sessions went well - like a good party, it develops its own momentum. fun flows. time flies. stuff piles up. Tomorrow's cares are scoffed away. "This is the perfect package for anyone who wants to make proper galactic disco/techno tracks... Love that old school futuristic sound! Great indeed!"